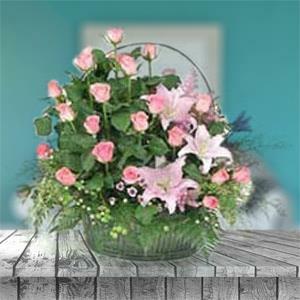 Send this lovely flower arrangement to India through RGCards.com. The flower arrangement includes 20 pink Roses, 1stem pink lili (3 Flowers), Daisies and Greens. Your dear ones will be overjoyed to receive these flowers as gift. You can send other Gifts to India with this lovely flower arrangement.